DaiQuan's Blog: Field of Head-Kicks (If You Call Her Out, The Butthurt UFC Fans Will Comment‬). Field of Head-Kicks (If You Call Her Out, The Butthurt UFC Fans Will Comment‬). 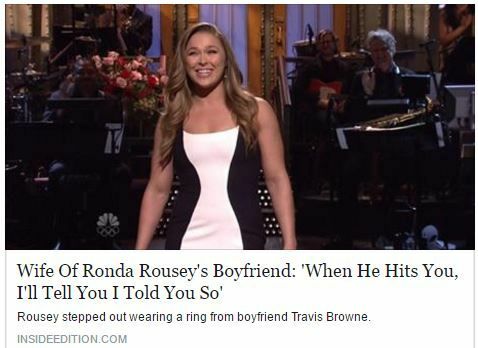 I just love that title: "Wife of Ronda Rousey's Boyfriend". Woman's so quick to judge others and call out other people's shortcomings, yet you're a sidechick to an abusive man, the same as all the other types of men you whine about. Stuff like that is why nobody likes you, Ronda Lousy.